Reality: humans make decisions based on emotions, and then justify the decision by rational explanations. Work out a story to persuade, call this version 1. Get feedback from surrogate fact-finders. Improve the story as possible. Assess the effect on strategy; what is the case worth, or if you are going to lose then settle or abandon. Jurors react emotionally to facts. As a result, their decisions are difficult to predict. With no jury research, the verdict can turn on unexpected jury attitudes, even when experienced attorneys represent the parties. As a consequence, trial presentation plans should be validated by jury research. Outside trial consultants provide the best quality validation. They should be used in cases with $1 million or more at stake. In other cases, in-house focus group research and practice trials can provide excellent information at a reasonable cost. This paper outlines how to carry out economical in-house jury research in order to win at trial. Some attorneys use their own instincts or experience to predict jury reaction. However, those in the jury box come from a different background than the attorneys. The attorneys have been living with the facts and wrestling with the law for a year. The jurors are confronted with both for the first time when the case is called for trial. They will not understand jargon, big words and complicated arguments. They will not care as much about the case as the attorneys or the parties. They are more swayed by emotion than the attorneys, who tend to be more swayed by logic. As a result, cases are often lost because the attorneys have not presented the case clearly enough, or because the jury has an unexpected emotional reaction to the facts. For a personal injury attorney, a defeat means no income. Personal injury attorneys often use jury research to improve trial presentation, to evaluate a case, and to avoid costly mistakes. Other civil litigators can and should use jury research to gain an advantage over their opposing parties. In trial the goal is not perfection, it is to win. With simple jury research, you can modify your presentation to emphasize themes that appeal to ordinary citizens on the jury. For a plaintiff’s case, a practice trial may reveal that an actual jury would not award the plaintiff anything, even though he suffered devastating injuries. Instead, the jury research may show that the case simply lacks jury appeal and should be settled to avoid the catastrophe of an expensive loss. For a defendant’s case, a practice trial may point out the facts that jurors rely on to limit liability or damages. One example, developed in medical malpractice cases, is the great emphasis jurors place on a patient not following through by keeping appointments. Whether the attorney is representing plaintiffs or defendants, the results of jury research often point out that certain themes have no effect, even after great emphasis by the attorney. Trial attorneys prefer to hire a trial consultant, to carry out research and practice trials for feedback on the trial themes. However, research and practice trials through a trial consultant’s office will be expensive, perhaps $50,000 to $100,000. For a big case, the attorney should recommend to the client that practice trials be carried out by trial consultants. Every case with more than $1 million at stake should have the assistance of a trial consultant, including practice trials. Trial consultants are very valuable in carrying out this work. For a big case, a trial consultant expenditure of $50,000 to $100,000 is appropriate. However, for a medium-sized case with $500,000 or less at stake, the cost is too much. This paper outlines the steps for in-house focus group research, including a practice trial, as appropriate for a medium sized case. Individual interviews are recommended to research the ordinary person’s attitudes toward the facts of the case. Even a few interviews will help to determine juror attitudes. They are an inexpensive way to quickly predict the jury’s view of the case. Fast feedback speeds up the development of emotional themes. With as few as 10 interviews of strangers from the street, you can be better prepared than your opponent. To try out your presentation of the facts, write out for each side a 10 sentence list of facts to set out the main points of what happened. The plaintiff’s version should be presented first and usually starts by describing what the defendants did wrong. Whether you represent the plaintiff or defendants, you must downplay your side’s story and emphasize the opposing side’s story in order to get accurate feedback. An assistant can conduct these interviews by going out and recruiting diverse passersby. The assistant should greet each person by saying “I am taking a survey about a law case and will pay you $5 for 5 minutes, would you like to participate?” For an example of an interview questionnaire, see Appendix B, call or email and request it. Exposing each side’s story to a few random passersby is the cheapest and fastest way to get reactions, begin developing emotional themes, and prepare for the practice trial. Once the case themes are planned out, you can hold a practice trial to determine how a group like the jury will react. Ordinarily, you will hold the practice trial a few weeks before the real trial, so that problems with the presentation can be corrected. First, imitate the source of the jury panel. For example, in the State Court in Portland, the jury panel will be Multnomah County residents chosen from the voter registrations and the Department of Motor Vehicles data. For additional jury panel information, see Appendix A. As a reasonable imitation of the jury pool, my office has called people at random from the local telephone book. On a weekday, in the early evening, the assistant calls a random telephone number and says: “Hello, I am calling to recruit people for a jury survey next Saturday, and will pay $60 for 5 hours attendance, lunch is provided. Would you like to participate?” Some will be interested. The assistant should ask a few questions to ensure that the participant will not be biased. You must completely disguise who is paying for the trial. Otherwise the jury will be biased and try to tell you what you want to hear. Moreover, the amount of payment should be the minimum to get average income people to participate, and no more. Overbook by 50%. If you want 8 people to emulate a federal jury, then recruit 12 people to attend. Confirm by written note, with a map to the site. If confidentiality is an issue, this can be signed by a legal assistant in a friendly law office. You must prepare both sides’ presentation. This forces early presentation of the basics of the case, and by itself will improve your trial presentation. But you should use a colleague as opposing counsel. On the day of the trial, the assistant should set up the room with a camcorder before the jurors arrive. The assistant should have each juror sign a confidentiality agreement. See Appendix B for a form. The entire process should be video taped. The judge will instruct the jury similar to standard jury instructions. Each side will make its opening statement. Each side will introduce basic evidence, e.g. witnesses and documents. If experts are important, you may wish to show some video or have the expert or an actor provide that information. Actors will play the opposing party and opposing witnesses. To get feedback on the effect of demonstrative evidence, you should use three visuals for each side. Make sure that the presentation slightly favors the opposing side. Unjustified optimism is not acceptable. The presentation will take about two hours for a simple case, more for a complicated case. After the presentation, the judge will charge the jury and the assistant will check to verify that the video tape is running. All deliberations will be video taped, but the attorneys will leave the room. When appropriate, provide lunch for the jury. The video should be kept running throughout the entire process. When the jury reaches a verdict, it should fill out a verdict form and give it to the assistant. When you review the video tape of the deliberation, you will be amazed. Then, after you recover, you will greatly improve your presentation for the real trial. In-house research is less informative than research by experienced trial consultants, but it is much less expensive. Typical costs for an in-house practice trial will be around $10,000. To further economize, ask friends to volunteer or discount their time to serve as opposing counsel, judge, opposing party and witnesses, and have the trial in your office. To get accurate feedback from the jurors, the entire exercise must be conducted with the seriousness of a real trial. Everyone helping must not joke, laugh or socialize, whether before, during or after the deliberations. Moreover, everyone must avoid terms such as “focus group”, “mock jury”, “practice jury” and “practice trial”. Such terms demean the process, weaken the seriousness of all participants and make the result less like the real trial. The juror participants are “Jurors” and this is a “Trial”. In Portland, I have used Tsongas Litigation Consulting, Inc., and highly recommend their assistance for Portland or Seattle. http://www.tsongas.com/. David Ball is a jury consultant headquartered in North Carolina. For a more detailed analysis of practice trial techniques, I recommend his book, How to Do Your Own Focus Groups, published by the National Institute for Trial Advocacy, http://www.nita.org/bookorder.asp. You can never predict with complete accuracy what a jury will do. But perfection is not required. All that is required is that you be better prepared than your opponent. The best preparation for a jury trial is good jury research. The first step is to determine how much is at stake. Then, decide whether you need to hire an outside jury consultant or do your own in-house research. Depending on the case, in-house research is often the best way to win by improving the trial presentation. 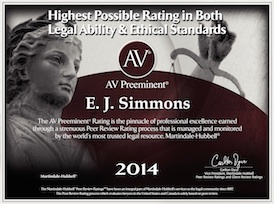 To discuss what would work for a particular case, call E. J. Simmons at 503-221-2000 or email ejs@simmonstrialpractice.com.